Happy weekend everybody! With Labor Day last weekend, I hope you’ve enjoyed a short, fast week and are looking forward to some more fun over the next few days. I’m planning on taking out my new fringe bag I picked up from Karen Millen! While there are a lot of fringe styles out there for fall (HUGE trend – shop a diverse selection here), I’m more interested in the simpler styles. I also wasn’t into the idea of spending a fortune on a (likely) fleeting trend and instead opted for a chic piece that is under $200. Because the style is so minimal, I think this bag could easily transcend the trends into next fall and the following years. 1. The eyelash fringe on this tuxedo shirt from Phillip Lim makes it a unique but classic white button-down. A girl can never have too many! 2. Leave it to Joie to create the perfect fall sandal in a rich, whiskey suede. They always design the most effortless pieces! 3. For a look that’s totally Proenza Pre-Fall ’15, but for a fraction of the cost, you gotta have this sweater. No, it’s not cheap, but it beats the $2,300 alternative! 4. Got booties on the brain? This pair by Sam Edelman is inexpensive and the answer to all your transitional dressing woes this season! 5. This velvety suede jacket is such an easy piece that will instantly dress up your favorite tee and jeans this fall. This outfit is so chic, Merritt! I love this top and fringe bag together. Obsessed with your bag! I just got a fringe tote from Nordstrom, and I’ve been using it all the time! The clutch is so fun and I love the details on your top. I just got a fringe bucket bag and while I was on the fence with fringe, I like it in small doses! Cute bag, Merritt! Have a great weekend! Love everything about this look! I love Karen Millen. I bought two dresses from her and wore one to a rehearsal dinner and the other to a wedding. Her designs are always so elegant and chic! I love fringe, but part of that is being a Houstonian and Rodeo.your bag is really nice and I think the best purchase for a trend. Gorgeous bag! Love what it adds to your outfit. 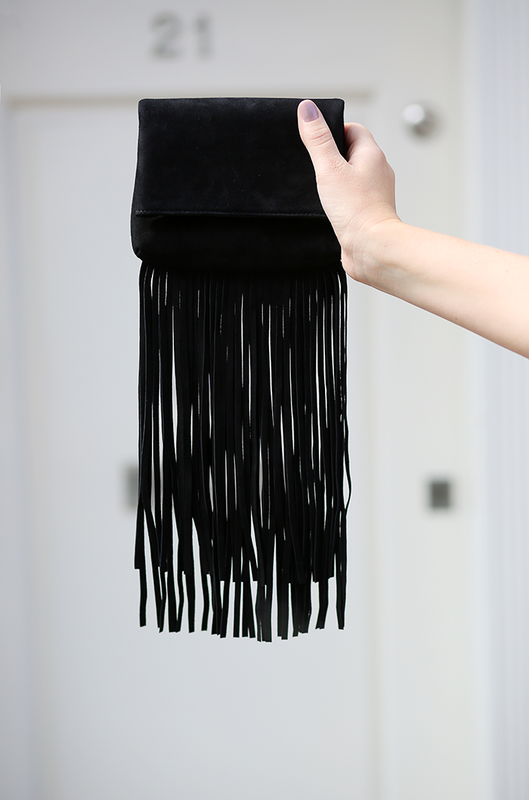 I just bought a fringe clutch too! loving the fringe bag! such a fun pop for a great casual outfit. This is such a chic look! I love the style of your top.